As I briefly noted last week, Middlesbrough’s ex-Woolworths store isn’t the only one on Teesside to have recently found a new occupant. 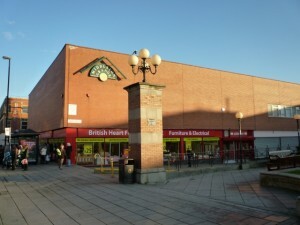 At the end of March, it was reported that Hartlepool’s former Woolies (store #322) – empty since the retailer’s collapse – is set to reopen as BHS in the autumn. 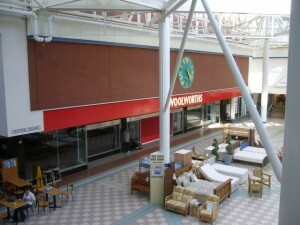 Originally opened in Lynn Street on 7 July 1928 (more of which in a future post), Hartlepool’s Woolworths branch moved to the then-new Middleton Grange Shopping Centre in 1970. The store originally had a large food hall, which was removed in 1986, and the store itself was downsized in 1990. As I observed previously, the space that Woolies freed up 21 years ago now houses Peacocks, Quicksilver and the British Heart Foundation furniture store, the latter accessed from the street rather than inside the shopping centre. I’d never visited the Woolworths store when it was still open, so wasn’t entirely familiar with the unit’s internal configuration. However, the drawings accompanying BHS’s recent planning applications for the site – H/2011/0207 and H/2011/0208 – make things much clearer. 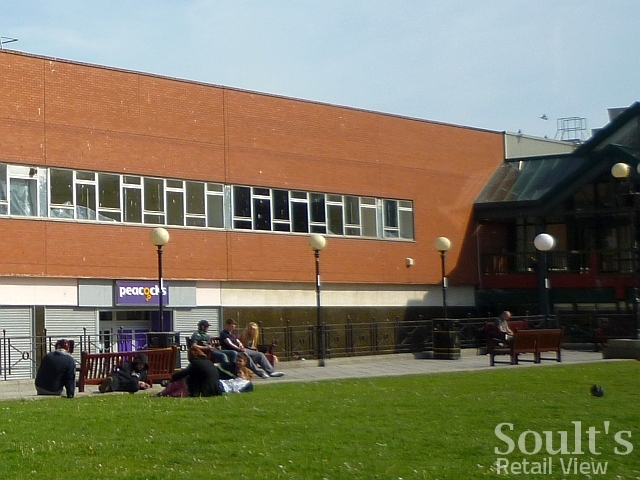 Despite a large proportion of the ground floor being occupied by other tenants since 1990, the plans make clear that Woolworths retained almost all the first floor. 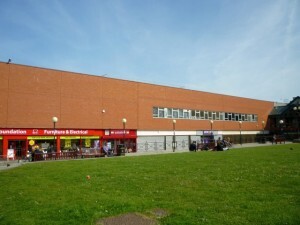 In the picture of the external (Queen’s Parade) frontage above, the ex-Woolies unit stretches the full width of the first-floor level – including the whole of the section with windows – with the British Heart Foundation store occupying just a small corner of the upper level facing Victoria Road, below. Looking at the ex-Woolies from Central Square inside the mall (below), I’d always assumed that the actual sales area covered both these levels, reinforced by the fact that there was an upper level fire exit in Victoria Walk, opposite The Galleries café. 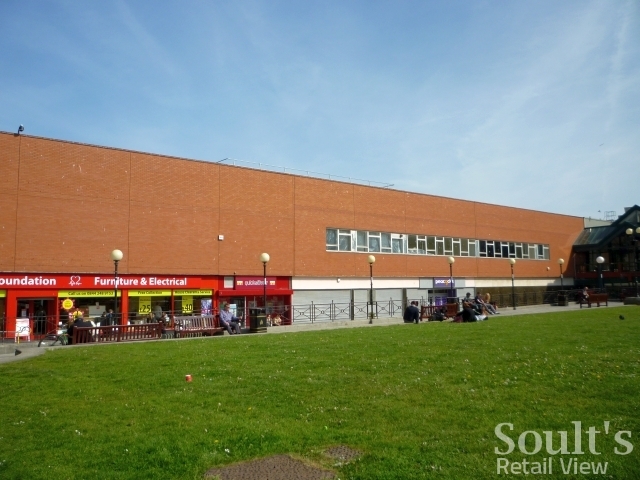 However, my impression from looking at the existing floor plans is that the post-1990 Woolworths’ sales area was, in fact, restricted to the ground floor, with the first floor used only for storage and staff rooms. I’m sure someone from Hartlepool can clarify whether that was indeed the case! Against this backdrop, BHS’s plans for the site are especially interesting. As well as retaining a 13,948 sq ft sales area on the ground floor, new escalators will connect to a further 8,073 sq ft sales area on the first floor. There will also be a 2,019 sq ft, 119-seater café, which – if I’m reading the plans correctly – will feature new glazing overlooking the mall’s Central Square. On the downside, the plans show that there will only be a fire exit – and no public entrance – to Queen’s Parade. 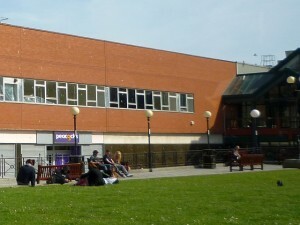 Before it was downsized, the Woolworths store had a prominent frontage overlooking Victory Square, and reinstating this for Peacocks and BHS would go a long way to addressing the relentlessly inward-facing feel of Middleton Grange. 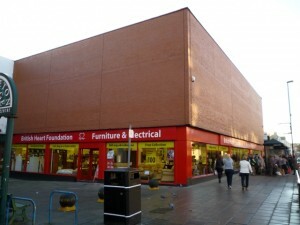 As it is, the tatty Peacocks frontage – with shuttered windows and old signage – is a disgrace, looking for all the world like a closed-down shop, and doing nothing to knit the store into the pedestrian routes surrounding the shopping centre. When I visited Hartlepool last week, there were signs of work going on inside the soon-to-be-BHS store, but nothing much to see due to all the windows being blacked out. Given the omnipresence of Middleton Grange’s security, I resisted the temptation to take any further interior shots, but will do my best to sneak something once BHS actually opens. 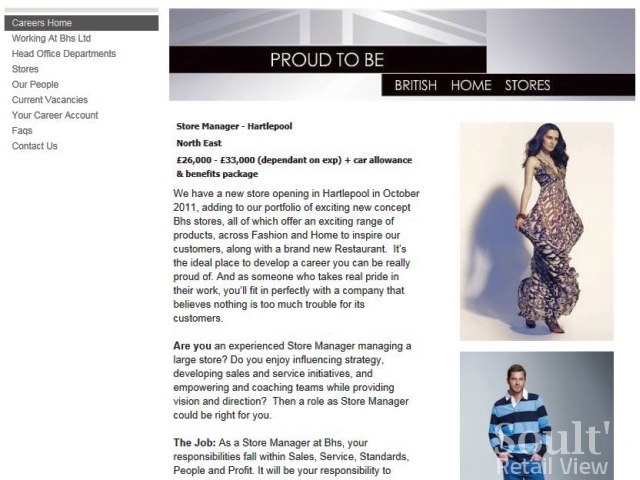 Various positions, including Store Manager and Restaurant Manager, are already being advertised on the BHS jobs website, which reveals that the “exciting new concept store” is set to open in October, and confirms that it will offer “an exciting range of products, across Fashion and Home, to inspire our customers, along with a brand new Restaurant.” This suggests that Hartlepool’s BHS may open slightly ahead of the new Northumberland Street store in Newcastle, thereby giving us a tantalising taster of what we can expect to see here on Tyneside later in the autumn. It may have taken Hartlepool two-and-a-half years to find a new tenant for its old Woolworths, but, ironically, it’s ended up with one of the best outcomes of any town or city in the North East. 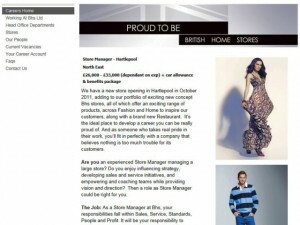 Back in December, while filming in Hartlepool with the BBC, I flagged BHS as one of the obvious potential occupants for the site, and it’s great that the unit is being filled not only with a quality name, but with a 24,000 sq ft store that will actually have more retail floorspace than its predecessor. 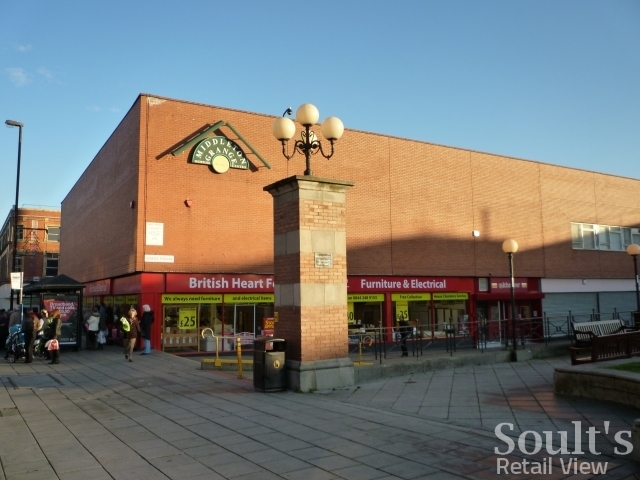 Hartlepool still lacks a proper department store such as Debenhams, Beales or House of Fraser, but BHS’s confidence and investment should give the town centre’s fortunes a welcome fillip. Where, and when will the job’s be advertised for this. Does anyone know please? Dear Graham, You say you viewd the plans . Can i ask did the plans show any works to the mall/square and where are the plans/how can i see them .Did the plans show any change to the existing structure or layout of the escalators in front of Mcdonalds. Hi Alex, the links are in the body of the post, where it says “However, the drawings accompanying BHS’s recent planning applications for the site – H/2011/0207 and H/2011/0208 – make things much clearer”. Click through, and you’ll see a link under the word ‘Images’ that says “Click to view Attachments”.